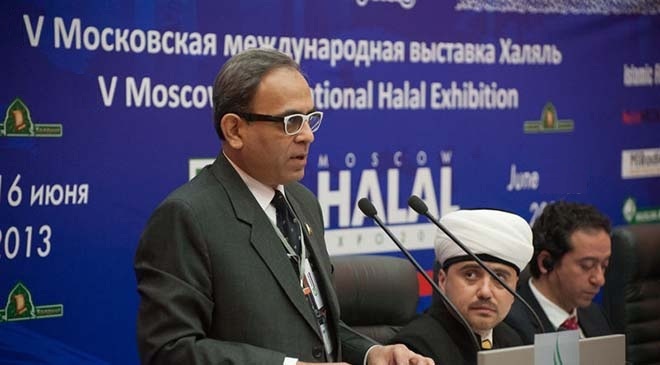 JNN 14 May 2014 Moscow : The 5th Moscow International Halal exhibition, “Moscow Halal Expo 2014” will take place in Moscow, Russia from June the 5th to June the 8th, 2014. The organizer of the exhibition is the Russian Muftis Council. With the increasing number of Muslims, the demand for halal products and services is growing every year. However, halal products and services are popular not only among Muslims, but also among people of other faiths and ideologies, as halal products are known for its quality and the sphere of halal services is based on mutual respect and honest cooperation. The Moscow Halal Expo Exhibition is to unite more than 200 exhibiting companies from Russia, CIS countries, South-East Asia, Iran, Pakistan, Turkey and other countries. The Exhibition consists of block-sectors on the following subjects: “Food & Agro“, “Tourism & Recreation“, “Perfumery & Cosmetics“, “Style & textiles“, “Catering“, “Health & Fitness“, “Education & Publishing“, “Finance & Investment“, “Services & Technologies“, “Media“, “Arts and decoration“. The exhibition provides an extensive business program, including Moscow Halal Business Forum, consisting of Fifth Moscow Halal Congress and Fifth Islamic Finance and Investment Forum. The main purpose of the exhibition and the Business Forum is to promote ethical business and finance in Russia, creating the necessary institutional environment. The exhibition contributes to the solution of such important tasks as the exchange of experience in the field of halal certification and Islamic finance, attracting attention to the production and distribution of halal products and services, establishing business contacts between representatives of domestic and foreign businesses. Another important event of the exhibition is 3rd Muslim Youth Forum, which will focus on improving the civil and social activity of the Muslim youth. Fifth Festival “Islamic style” united designers, fashion houses and buyers. Tasty halal dishes will be shown at 3rd Cuisine show, where everyone can enjoy the masterpieces cooked right in front of visitors. This entry was posted in Europe and tagged halal food, Halal Global Market, Halal Industry. Bookmark the permalink.